A wonderful afternoon and evening of nautical wedding photography for Alejandra and Erik on the Big Bay in San Diego, California. 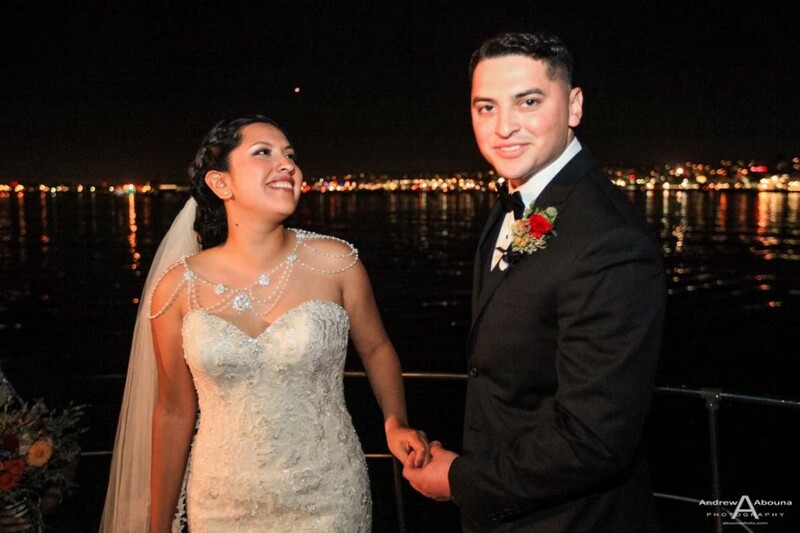 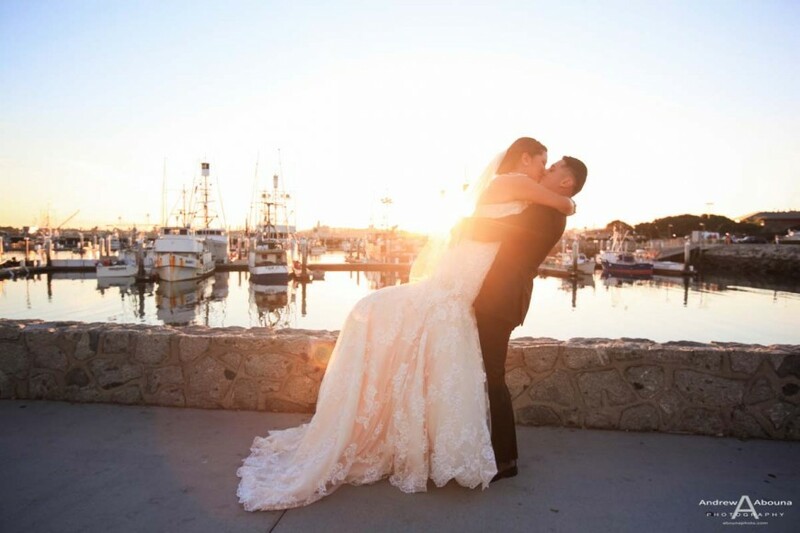 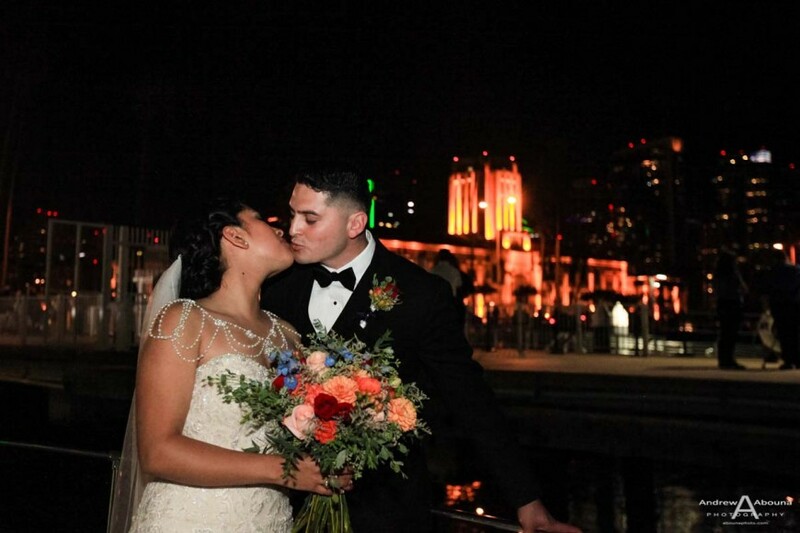 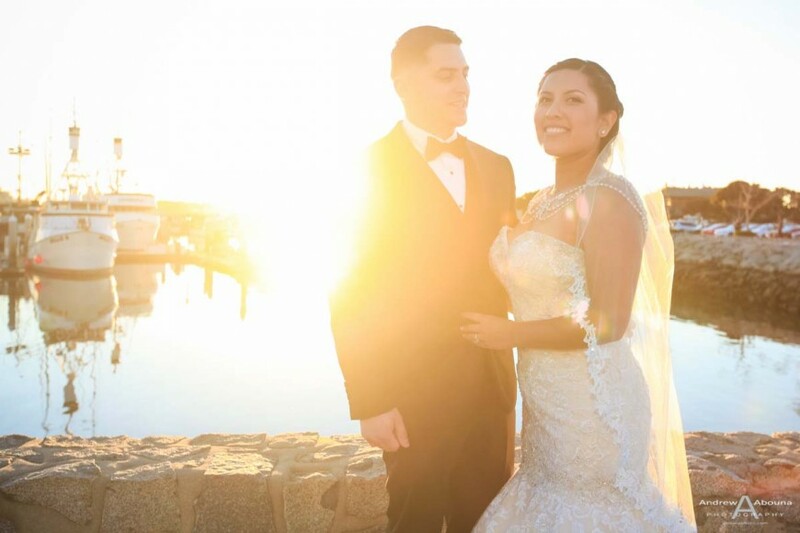 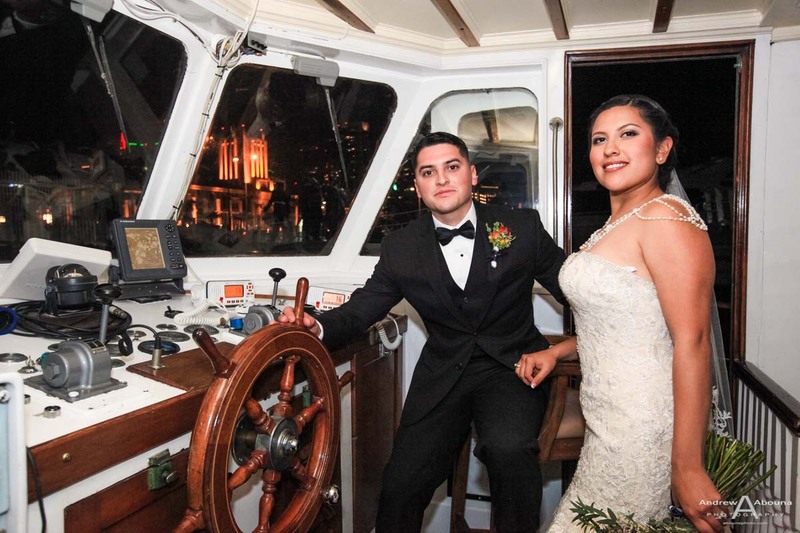 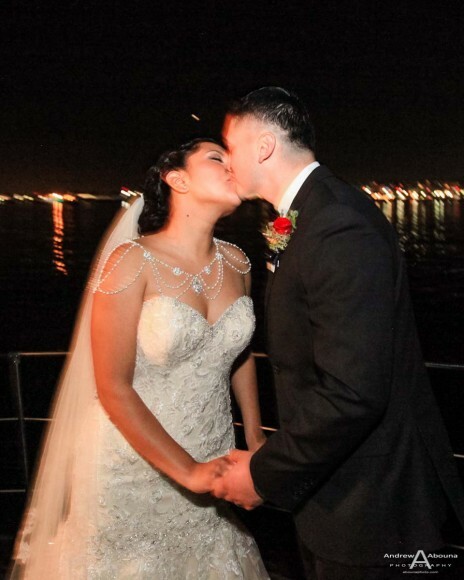 From bridal photography near Seaport Village and the USS Midway, to a lovely ceremony and reception aboard the classic and historic motor vessel Renown for their Hornblower wedding San Diego, the couple surely enjoyed a most memorable wedding day. 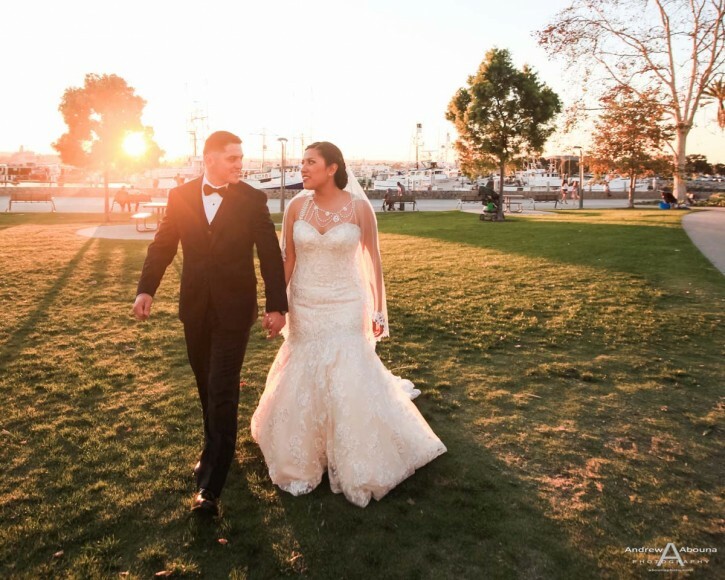 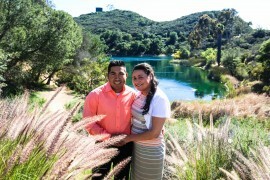 It was just before dusk that Alejandra and Erik and I met to begin their wedding photography. 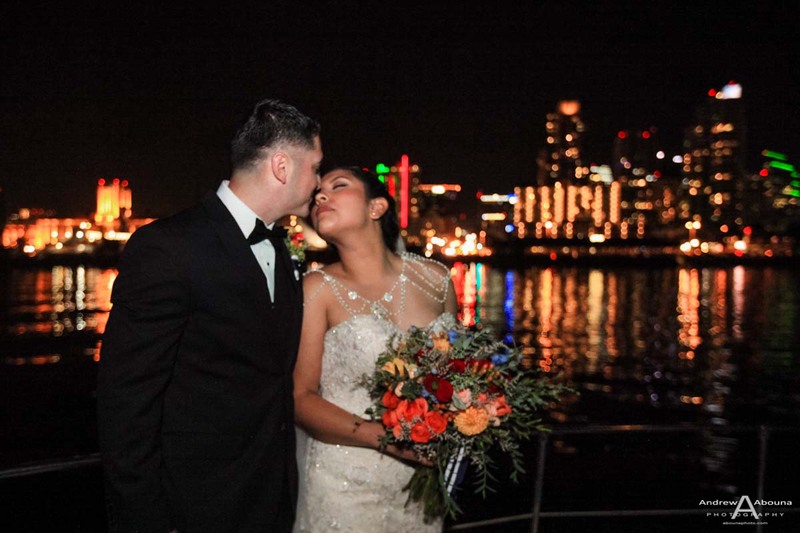 We started first with photos near Seaport Village, where tuna boats were docked. The reflections on the water of the boats and the near-setting sun made for warm lighting tones, and some nice scenery. 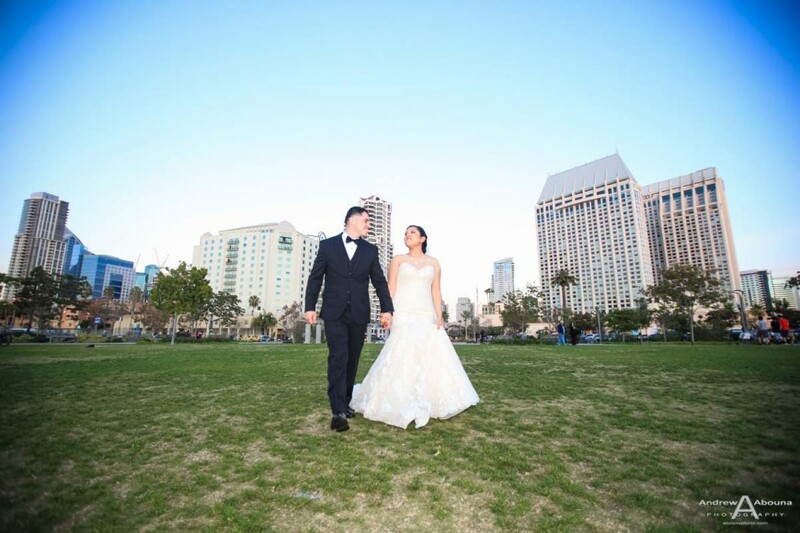 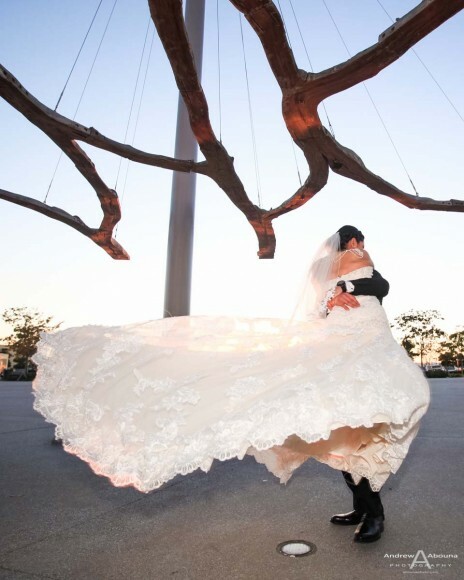 Nearby sculptures, a grassy park, and the tall buildings like the Hyatt and other buildings helped make for some impressive, if not dramatic wedding photos. 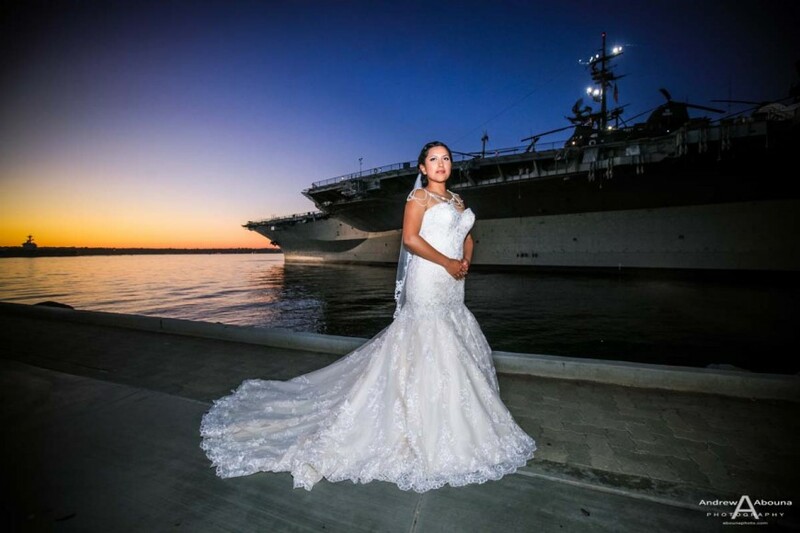 We had some time before we were to board Renown for the couple’s Horblower wedding San Diego, so we made our way over to the well-known sailor nurse kiss statue across from the USS Midway Aircraft Carrier Museum for some posed and family photos. 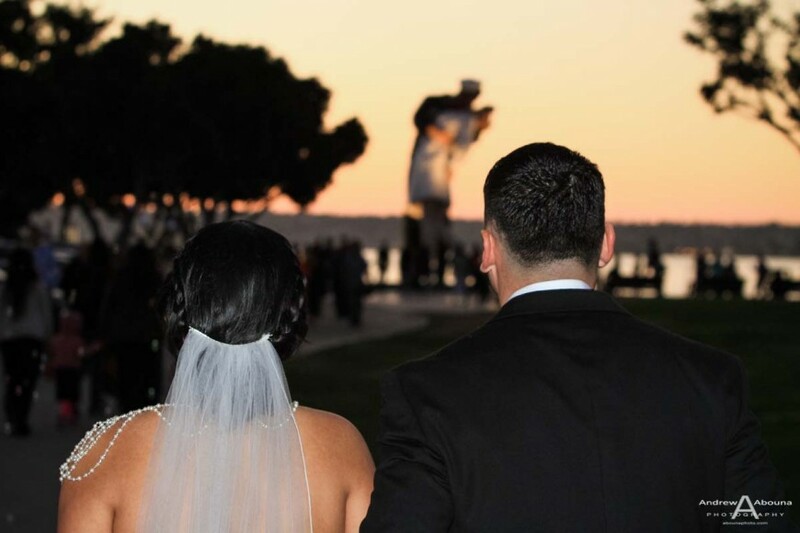 The statue is often a busy place with many tourists around it, but when the soon-to-be newlyweds approached, and me with my cameras, everyone kindly gave us a few minutes on our own with the statue. 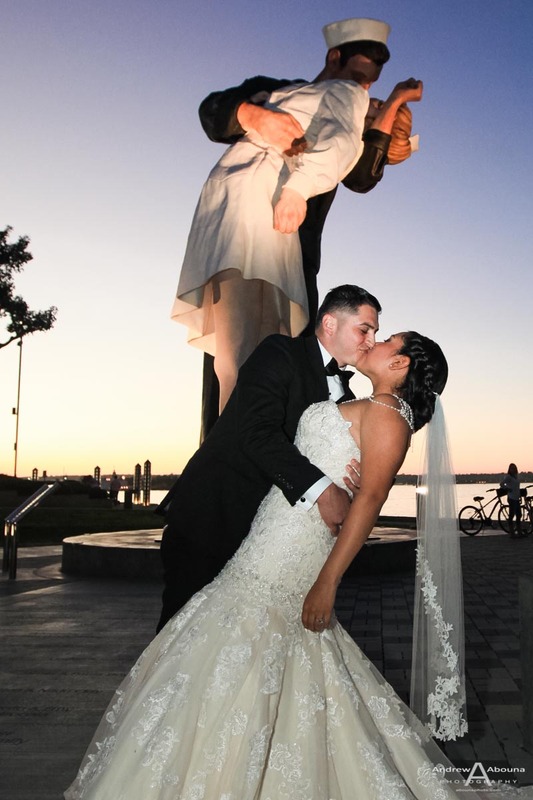 The couple replicated the pose of the statue, and then we moved closer to the Midway for some family photos with the darkening and colorful sky from the setting sun. 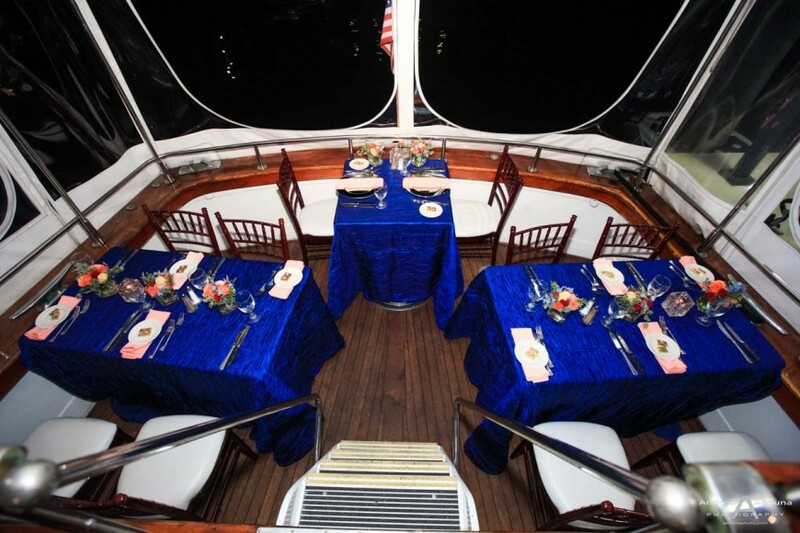 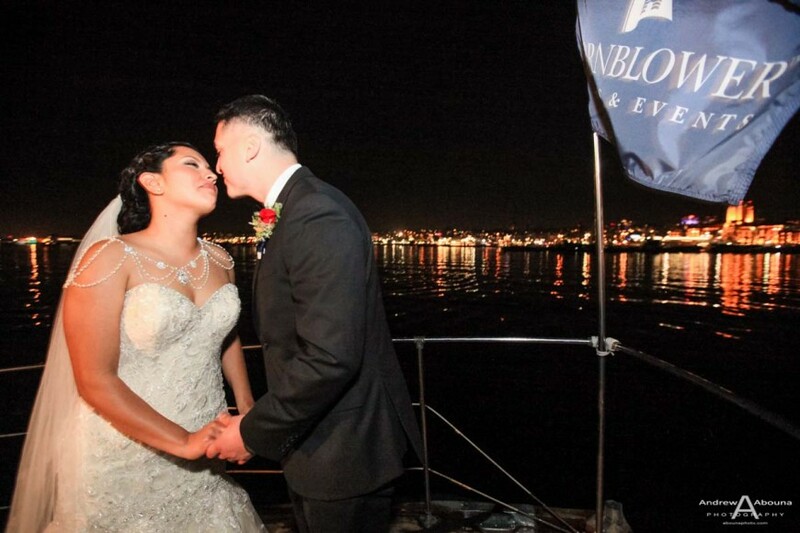 It was now time for us to take a short drive to the Renown for the couple’s Hornblower wedding on San Diego Bay. 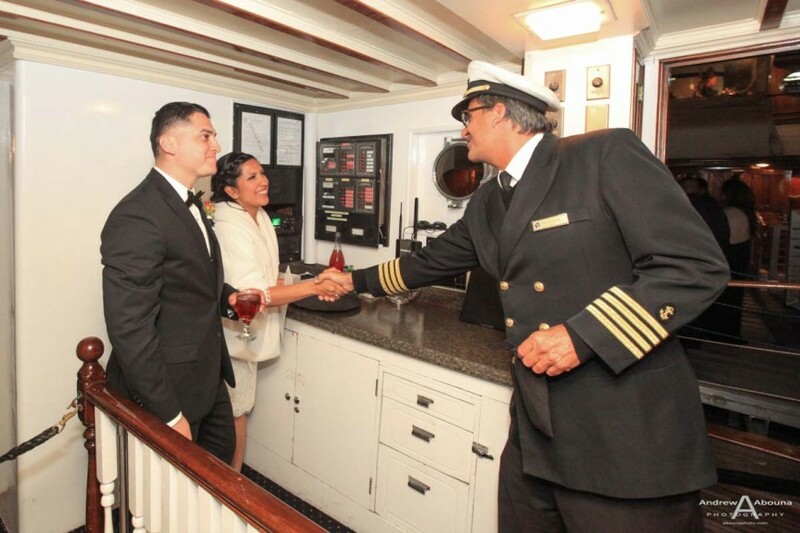 At the motor yacht Renown we were greeted by Captain Roy, Drew the Events Manager, and Sally the Bartender. 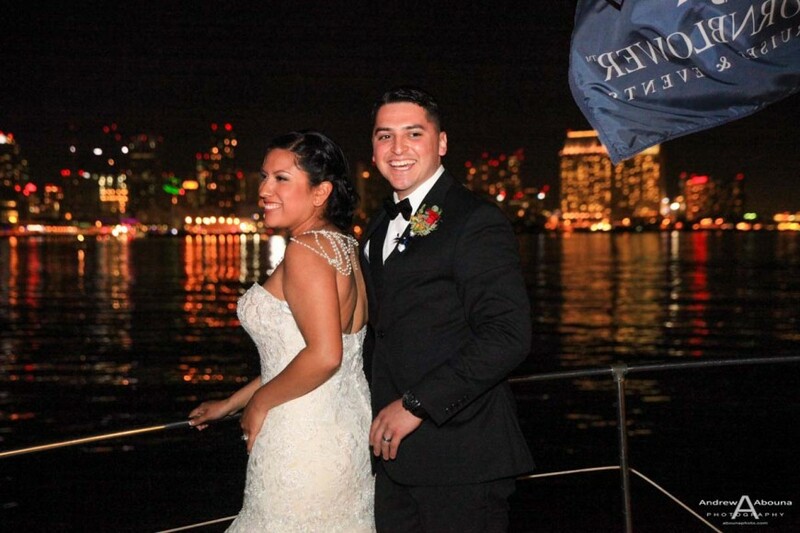 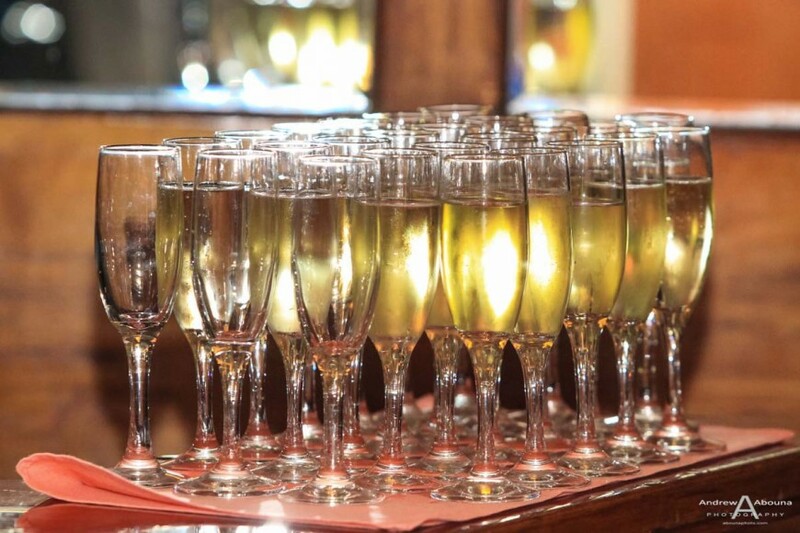 It was great to work again with Drew, who, like all of the Hornblower staff, always ensures the finest service and the best event experiences. 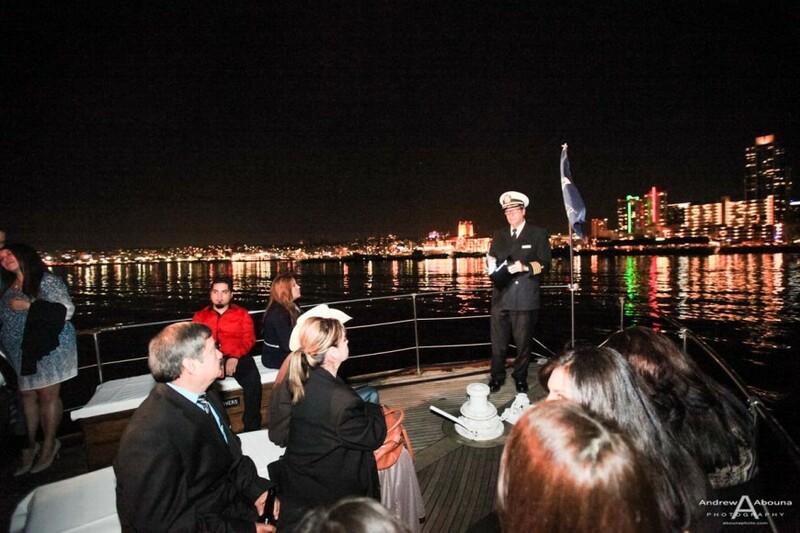 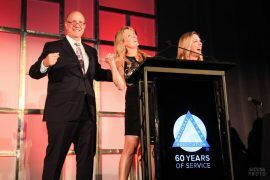 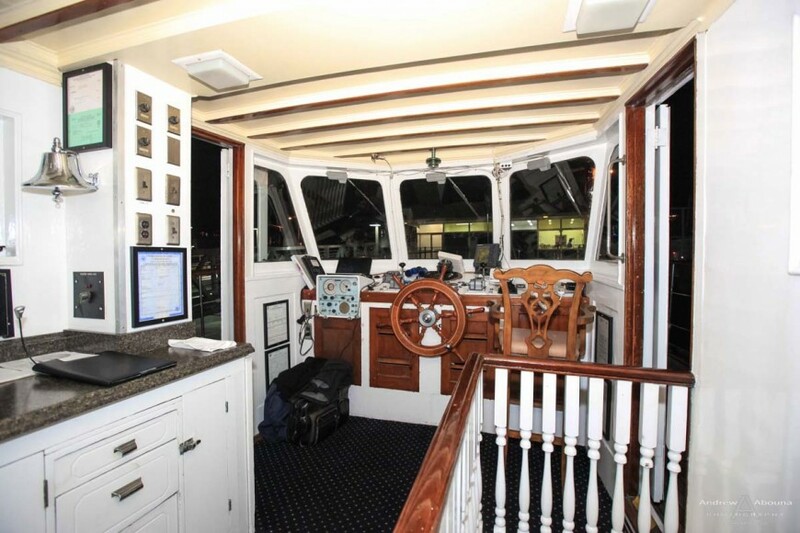 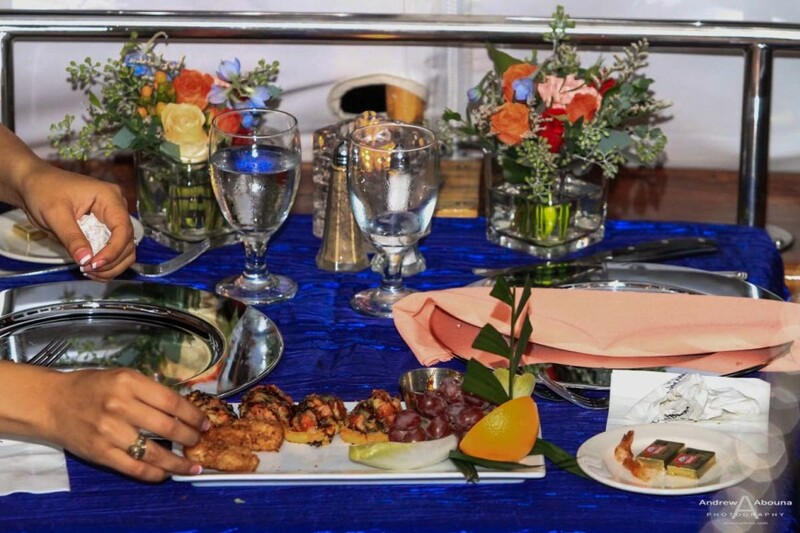 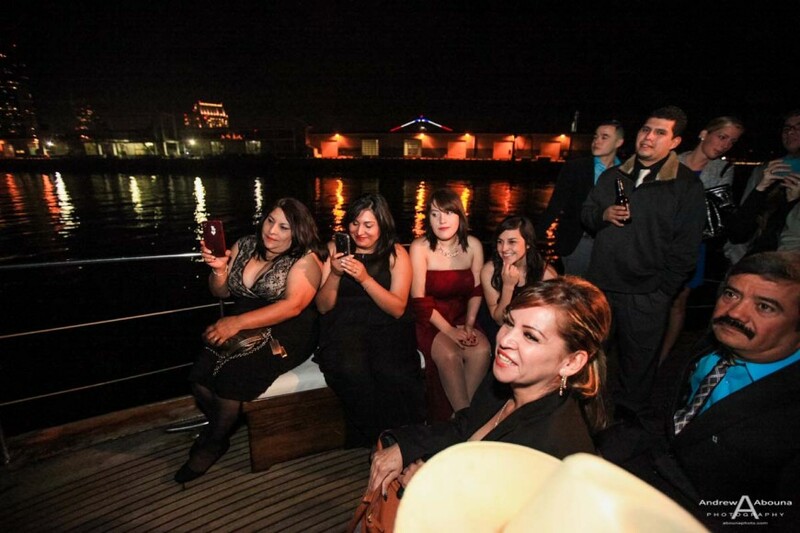 With all of the guests of family and friends now aboard, the captain powered up Renown and took us out onto the bay to position the vessel so that the downtown San Diego nighttime skyline became our backdrop. 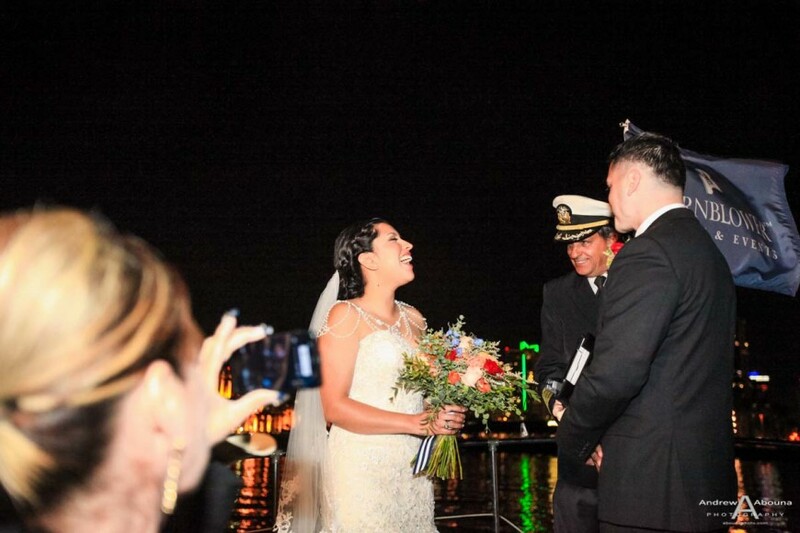 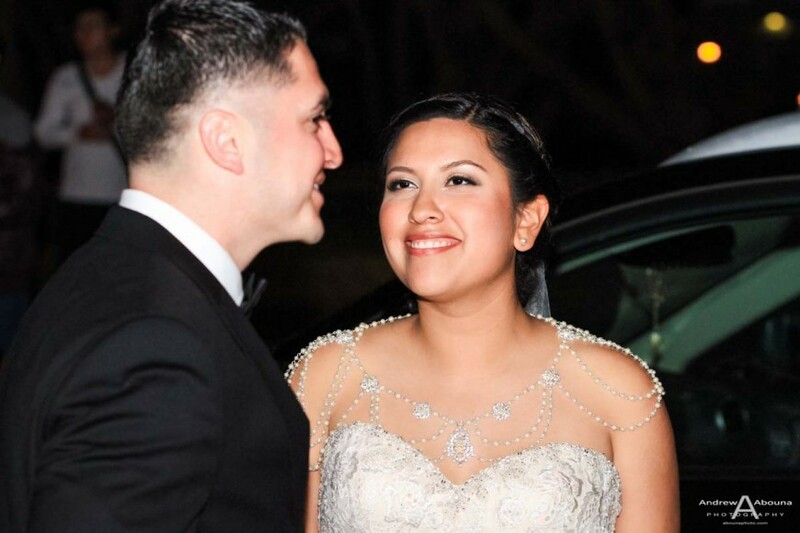 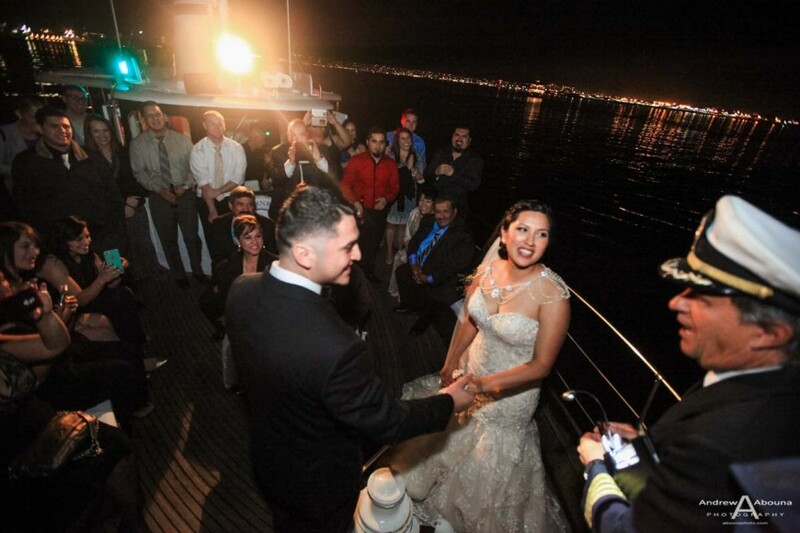 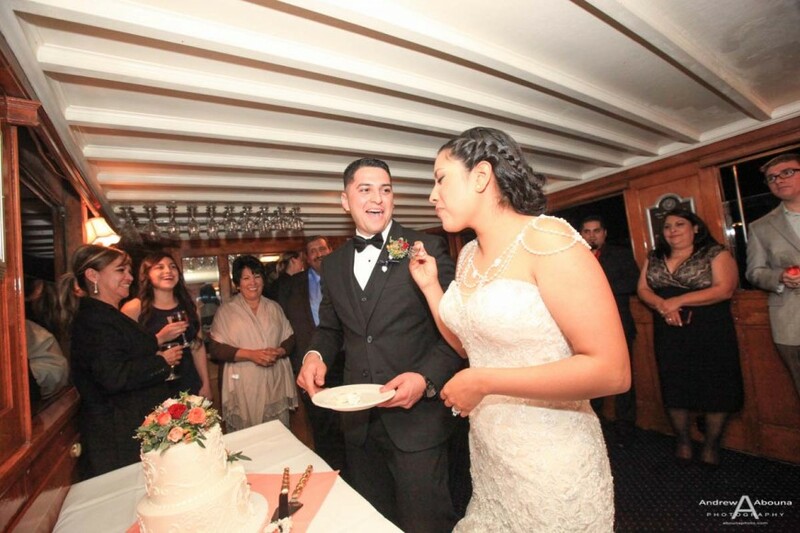 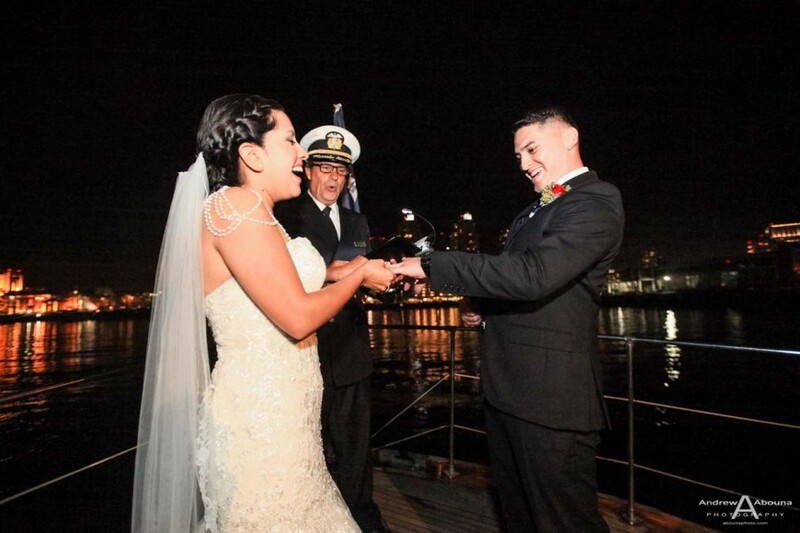 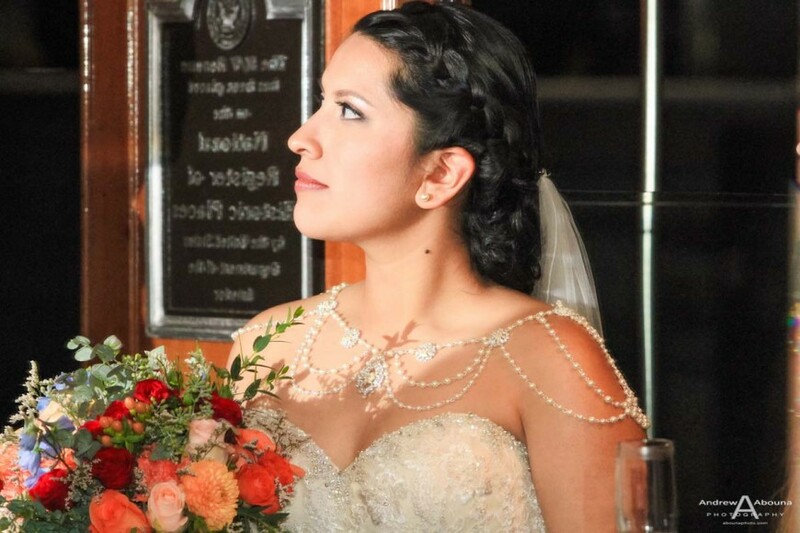 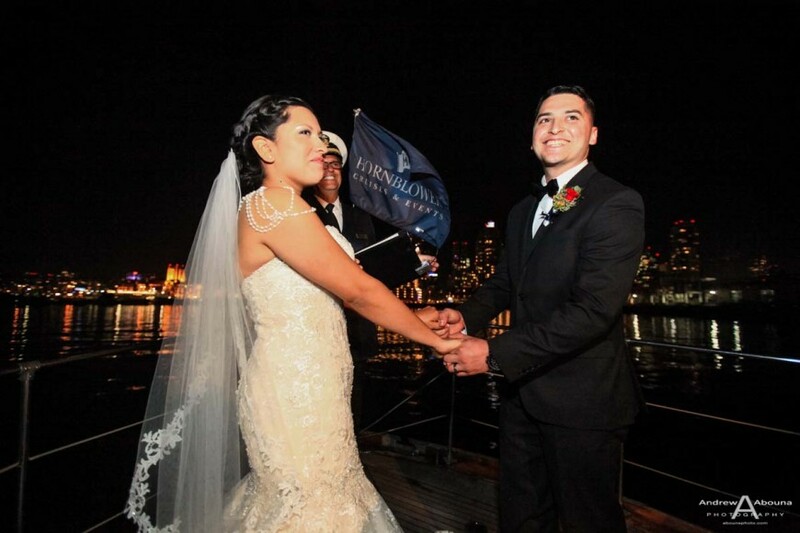 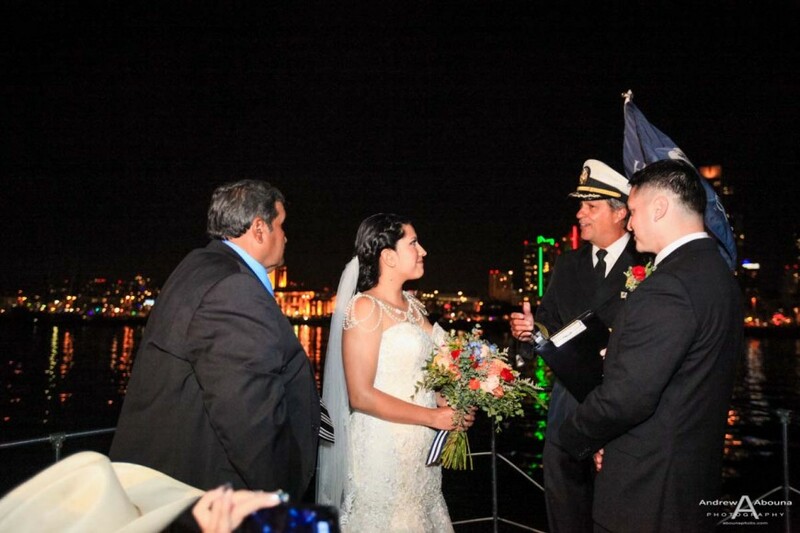 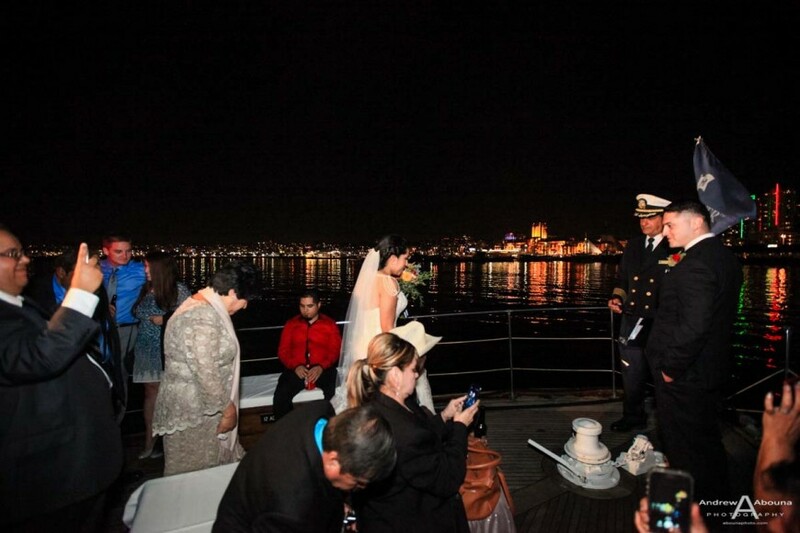 At this point Captain Roy came to the bow of the vessel to preside over Alejandra and Erik’s wedding. 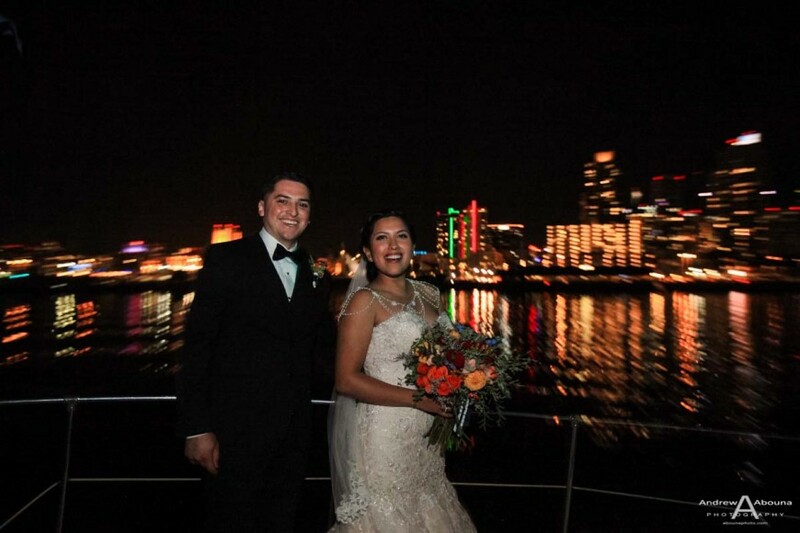 Though it was nightime and the sky was pitch black, the City of San Diego nighttime skyline sure made for a nice setting, particularly since we were aboard the Renown for Alejandra and Erik’s Hornblower wedding. 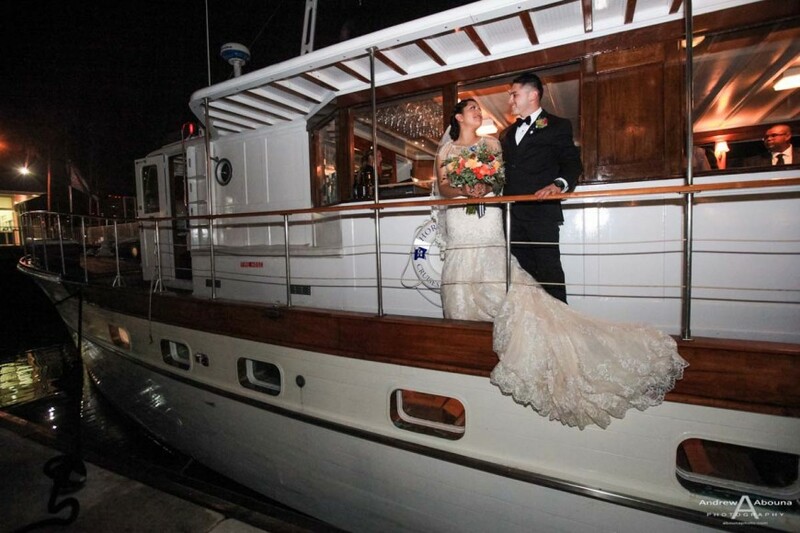 Captain Roy performed a wonderful maritime wedding. 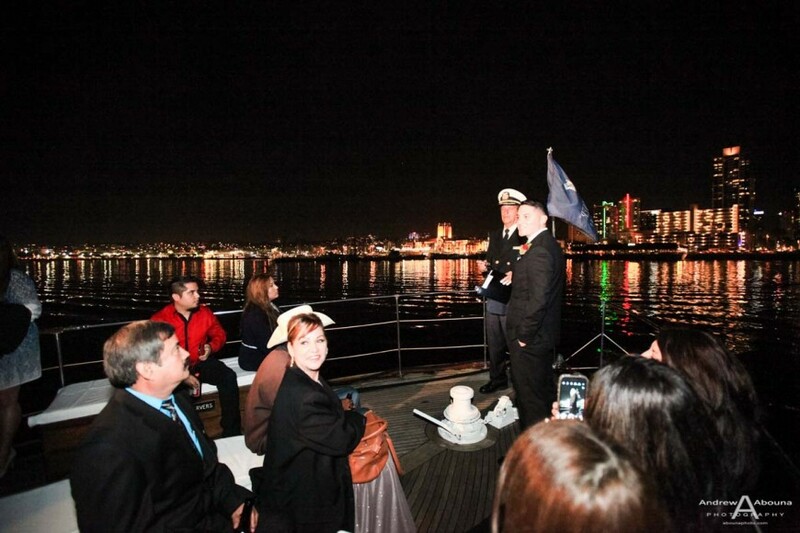 The wedding ceremony was fun, too, and all of the guests really enjoyed the wedding aboard this fine yacht on San Diego Bay. 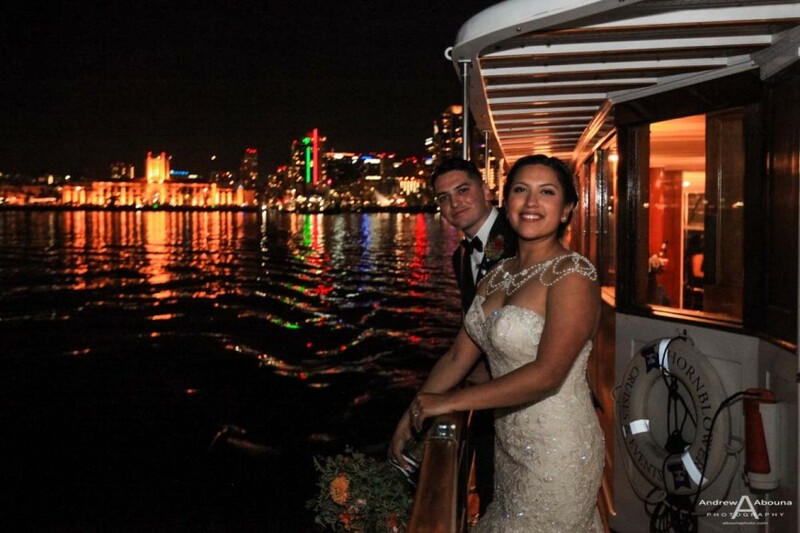 After the ceremony we captured a variety of photos, both posed and candid on the bow of the boat, and then inside as appetizers and then the nice meal was served. 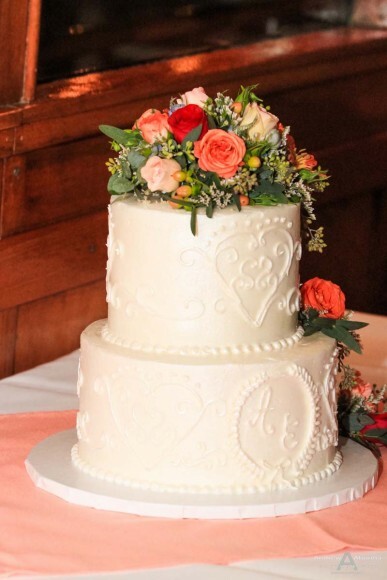 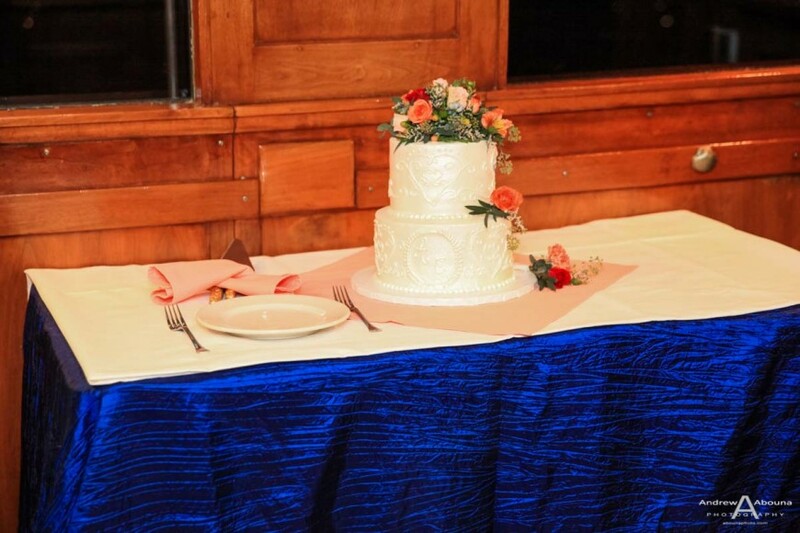 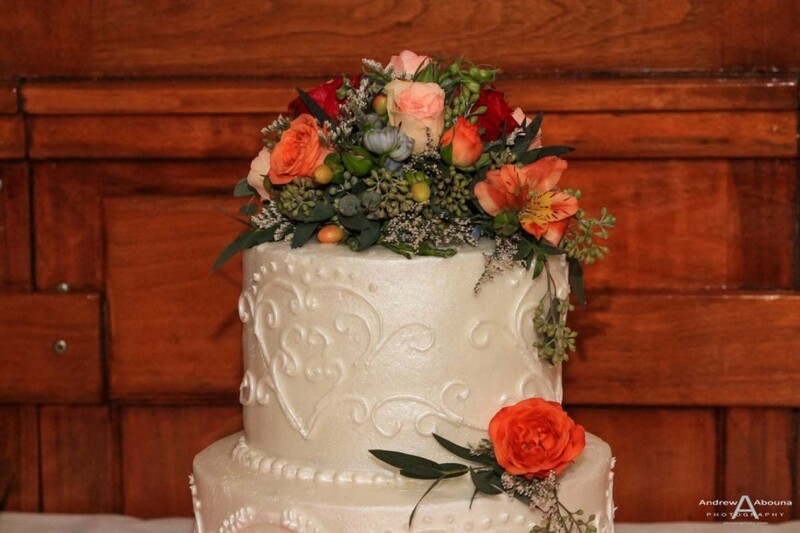 Following dinner the couple cut their two-teir wedding cake, which was topped with a nice mix of flowers. 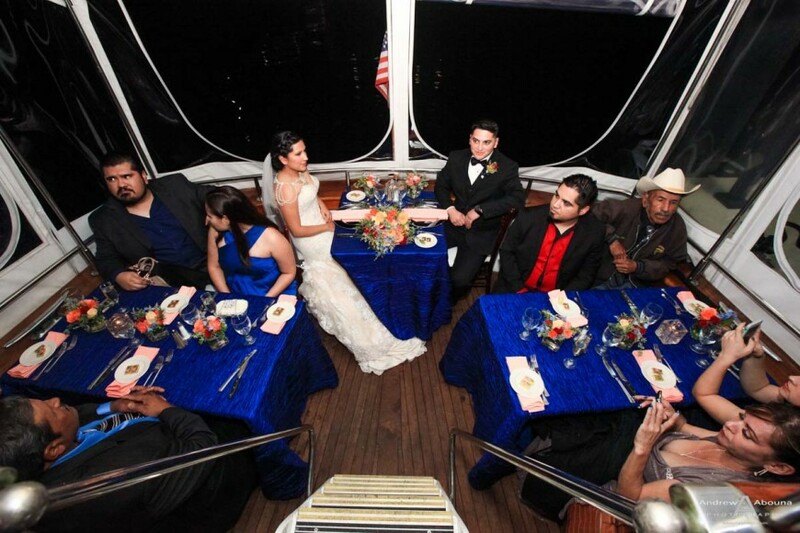 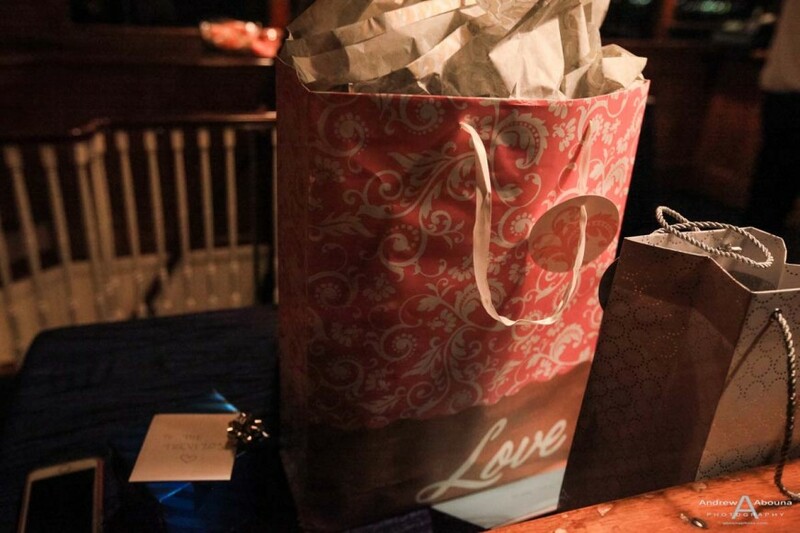 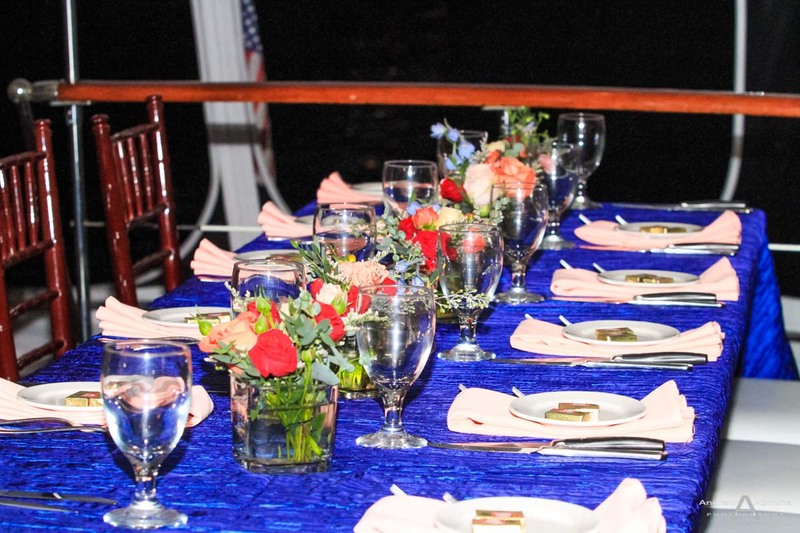 The four-hour wedding and evening cruise was a delight to photograph. 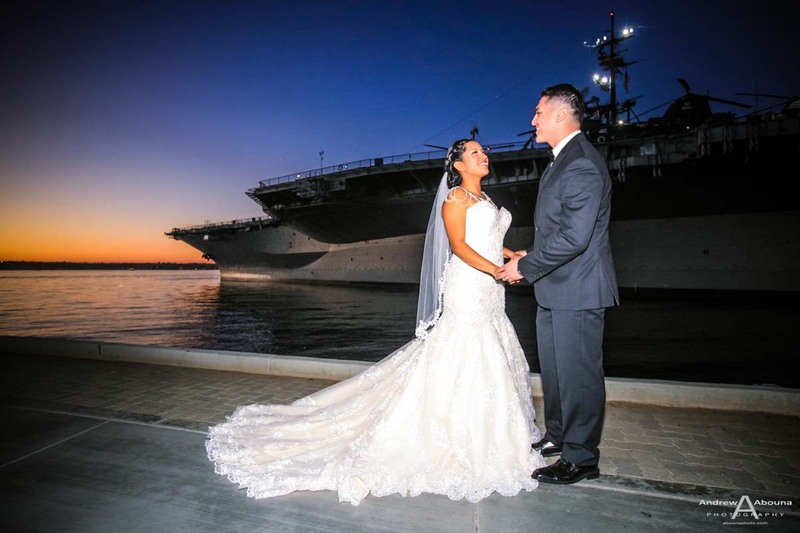 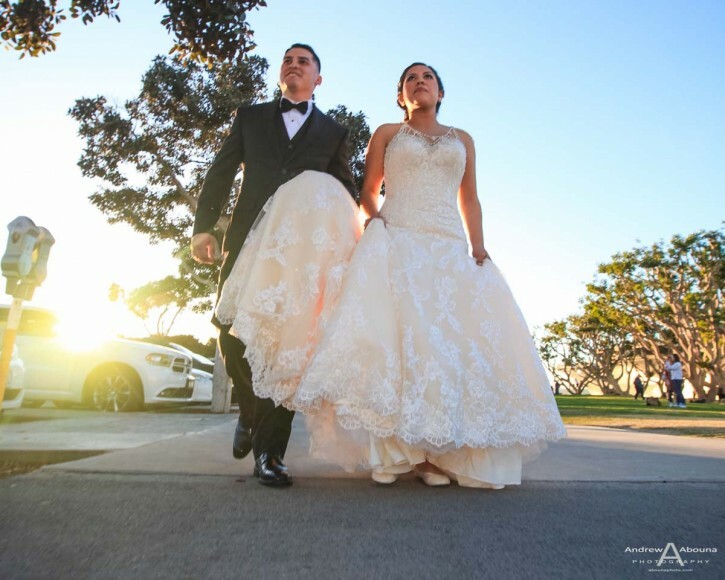 The small collection of my favorites of the couple’s Hornblower wedding photography featured in this article begin to tell the story of couple’s wedding day. 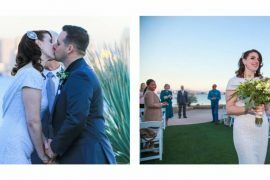 But it’s their complete collection of photos that are a treat to see, which you can access at my San Diego Wedding Photographer Client Galleries (password required). Alejandra and Erik’s wedding photography package includes a private online gallery of photos to view and share, a collection of prints, a DVD with all of their photos in high resolution and full print rights, and a nice mounted Standout print of another favorite image that’s ready to hang on their wall. 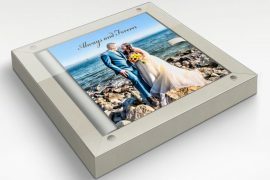 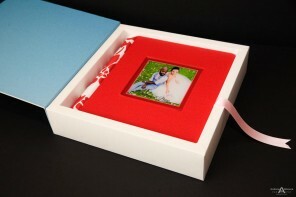 And with so many great wedding photos that I created for the couple, the very best way for them to enjoy them is going to be in a beautiful, Italian-made wedding album so that their photos are always available to see, touch and share. 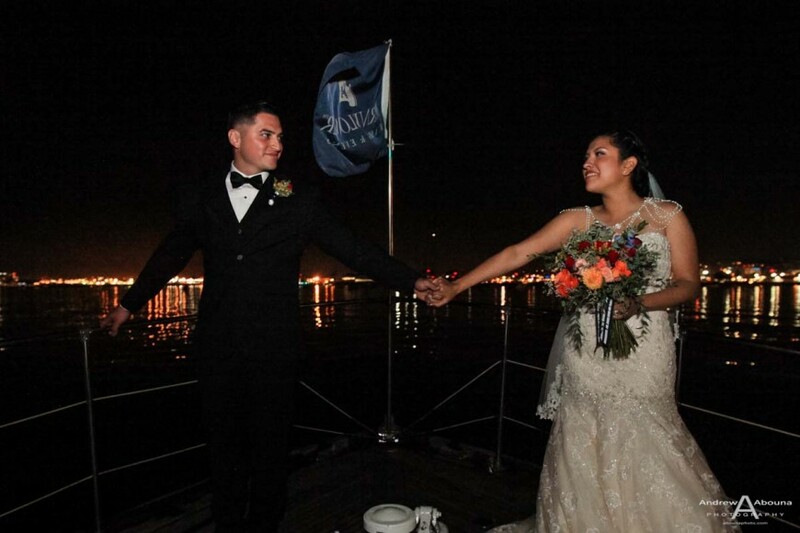 Congratulations, Alejandra and Erik, and thank you for your service, both active and retired, respectively. Wedding photography with bridal photos near Seaport Village and USS Midway, to a lovely Hornblower wedding San Diego aboard the historic motor yacht Renown.